If you heard Dayak tribe, you may think that the tribe was deep in the middle of kalimantan jungle which is hard to reach. 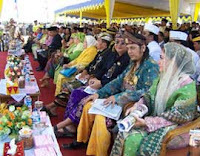 But not for Dayak Kenyah tribe, you just go to the north of Samarinda, East Kalimantan, the exact location was in the Pampang village. 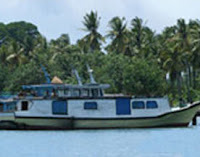 Dayak Kenyah village is not too hard to reach. You don’t have to climb or hike mountain or even travel through the jungle. 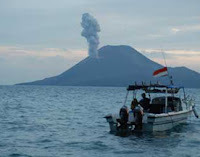 This village only about 20 km from Samarinda and you can use motorcycle or car because the road is smooth. Actually, Dayak tribe who live in the Pampang village is Dayak Kenyah sub-ethnic. Long time ago, this area was a jungle, but after Dayak Kenyah people (35 people) from Long Us village, immigrated, this are began to develop until now. Now, Pampang’s citizen is about 1,000 persons. 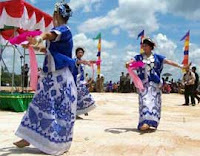 Even, they got modern culture form outside the village, the citizen still hold their tradition. Dayak sub-tribe in all of Kalimantan are about 19 sub-tribe. Each sub-tribe has their own leader (chieftain) and has different culture. 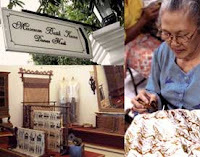 Dayak Kenyah People in Pampang still hold their ancestor tradition, such as weave, carve, and make some handicraft. 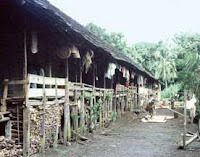 There is also Lamin (long house, the Dayak’s house). For tourists who want to buy some souvenir, they can but it from the seller who sell beads, wood statue, or key hanger around it. Every holiday, Dayak people celebrate many traditional dance in Lamin, like Kancet Lasan dance, Kancet Punan Lettu, Kancet Nyelama Sakai, Hudog, Manyam, Pamung Tawai, Burung Enggang, and Leleng dance. 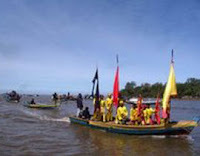 Every year they celebrate traditional ceremony, they called it Pelas or Alaq Tau. You’ve got to be struck if you see it. Pelas is a ceremony to thank to God after harvest moon which is celebrate every June, but the date is always change depend on the good day. The ceremony begins with greeting from the chieftain then continue with attraction show and Dayak Kenyah’s traditional dance. 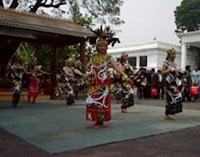 Those dancers were kids and elders and often invited to show their dance in Indonesian embassy such as Japan, China, USA, German, Switzerland, and other countries. Dayak Kenyah life is just like other people. 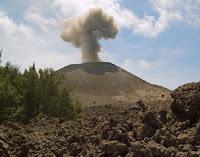 They knew technology and many of them work on non government company and government office. So, if you don’t have much time to see the original Dayak people, the Dayak tattoo, the Dayak long ear, Lamin and craved statue, you can go to Budaya Pampang village in Samarinda. 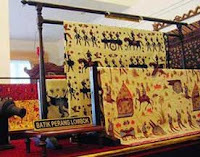 To come to the Budaya Pampang village, you have to rent a taxi or you can use vehicle’s motor through Samarinda-Bontang high way. This culture village only 5 Km from the high way. 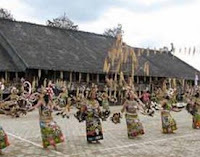 Here, you can see Lamin or Dayak tribe traditional house, traditional dance and Dayak Kenyah ceremony. 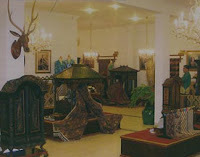 Every Sunday you can see traditional ceremony. It starts from 2 pm. Try to be polite if you interact with them. If you take a picture of the Dayak Kenyah elders who have long ear, they will ask you to pay them about 20,000 – 50,000 rupiahs.